This is now a downhill park. There is one multi-use multi direction trail, Minors Loop. Currently there is a free shuttle running from 10-7 Thursday-Sunday. This is supposed to switch to a paid shuttle sometime in mid August 2018.
beacham trailhead at the camp grounds is mostly fireroad up to where you cross the lake dam, the overlook section spurs off at a couple points. Then the trail turns to singletrack, few rideable techincal sections nothing to serious. A: Yes, ride up the west side of the Lake on Beacham Trail across the dam and down the other side for a ways, it becomes technical on the SE corner of the Lake. Just turn around or walk. I initially went counterclockwise and walked the first quarter of the loop around the lake. I then headed to the Overlook Trail. I walked parts but was able to ride most. 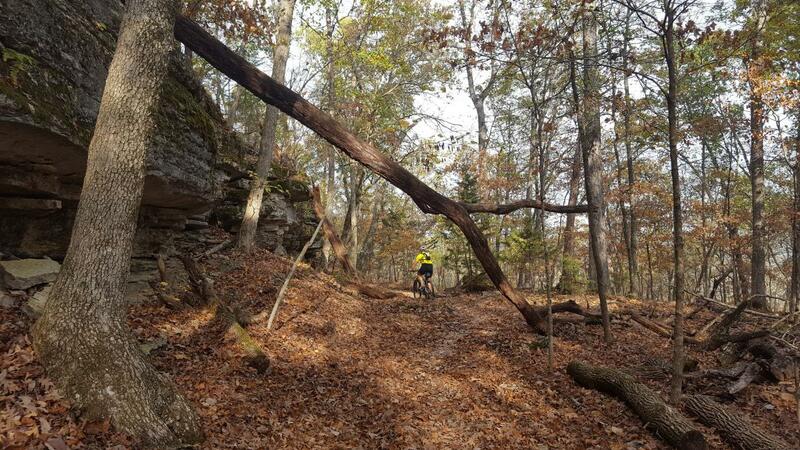 Best to ride overlook trail counterclockwise for the most downhill. I rode clockwise and wished I had gone the other way. 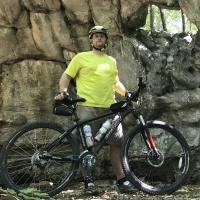 I'm 57 and this was my first MTB Trip just bought a new bike. I am in good shape. Not sure if beginner means out of shape or non technical MTB rider. Review: This was a fun place to ride. The downhill challenge trail is as hard as you make it by going faster or sending some of the pretty hefty sized jumps, wich are easy to go around and look very well made. The climb is totally doable. Definitely not worth hiking up with a DH rig, mid travel trail bike is perfect for this trail. 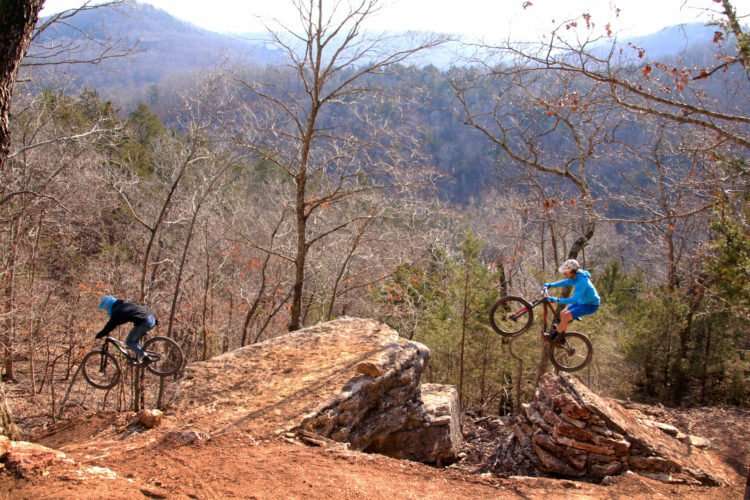 Review: Great network of trails in the hills around the lake. 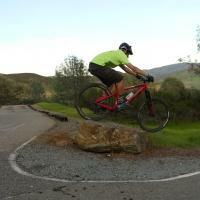 Some technical features with extended climbs and decents, creek crossings, and rambling bench trail. 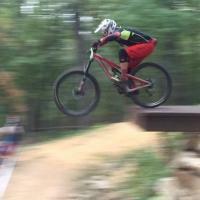 Trails provide opportunities for all skill levels. There is even a paved loop around the ball fields. Review: I'm reviewing this from a beginner perspective. If trails are rated on basis of "will I return", then its a fun ride. I say this place has a little bit of every level. As a beginner, I'll be back. The Beacham Trail going clockwise is a beginner 3/4 or a little less around lake. The Overlook Trail is steep but good trail. I rode it clockwise, would do it other way next time for more downhill. I walked sections more than I wanted on SE corner of Lake. Review: Beautiful country. Challenging rock gardens and water crossings. Couldn't get into a rhythm here but I was on a hardtail. This place is built for a gravity or all mountain bike. Still had a great time. Review: A good trail system. Worth a weekend trip from KC. However, talk to someone with knowledge of the trails before going. It's an older, multi-use system and some trails aren't great for biking. Lake Leatherwood MTB Trail 3.75 out of 5 based on 5 ratings. 5 user reviews.